Diabetes mellitus is a group of metabolic diseases characterized by high blood sugar (glucose) levels, that result from defects in insulin secretion, or action, or both. Diabetes mellitus, commonly referred to as diabetes (as it will be in this article) was first identified as a disease associated with “sweet urine,” and excessive muscle loss in the ancient world. Elevated levels of blood glucose (hyperglycemia) lead to spillage of glucose into the urine, hence the term sweet urine. Normally, blood glucose levels are tightly controlled by insulin, a hormone produced by the pancreas. Insulin lowers the blood glucose level. When the blood glucose elevates (for example, after eating food), insulin is released from the pancreas to normalize the glucose level. In patients with diabetes, the absence or insufficient production of insulin causes hyperglycemia. Diabetes is a chronic medical condition, meaning that although it can be controlled, it lasts a lifetime. Insufficient production of insulin (either absolutely or relative to the body’s needs), production of defective insulin (which is uncommon), or the inability of cells to use insulin properly and efficiently leads to hyperglycemia and diabetes. This latter condition affects mostly the cells of muscle and fat tissues, and results in a condition known as “insulin resistance.” This is the primary problem in type 2 diabetes. The absolute lack of insulin, usually secondary to a destructive process affecting the insulin producing beta cells in the pancreas, is the main disorder in type 1 diabetes. In type 2 diabetes, there also is a steady decline of beta cells that adds to the process of elevated blood sugars. Essentially, if someone is resistant to insulin, the body can, to some degree, increase production of insulin and overcome the level of resistance. After time, if production decreases and insulin cannot be released as vigorously, hyperglycemia develops. Glucose is a simple sugar found in food. Glucose is an essential nutrient that provides energy for the proper functioning of the body cells. Carbohydrates are broken down in the small intestine and the glucose in digested food is then absorbed by the intestinal cells into the bloodstream, and is carried by the bloodstream to all the cells in the body where it is utilized. However, glucose cannot enter the cells alone and needs insulin to aid in its transport into the cells. Without insulin, the cells become starved of glucose energy despite the presence of abundant glucose in the bloodstream. In certain types of diabetes, the cells’ inability to utilize glucose gives rise to the ironic situation of “starvation in the midst of plenty”. The abundant, unutilized glucose is wastefully excreted in the urine. Insulin is a hormone that is produced by specialized cells (beta cells) of the pancreas. 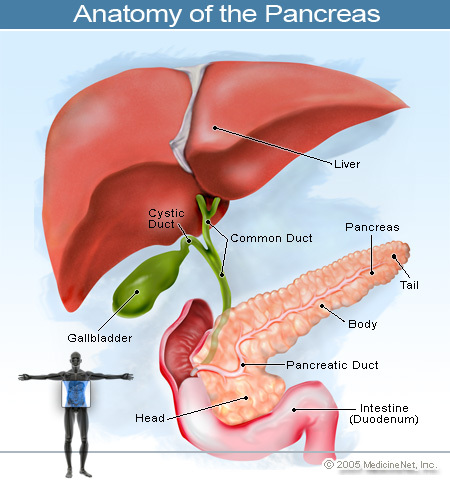 (The pancreas is a deep-seated organ in the abdomen located behind the stomach.) In addition to helping glucose enter the cells, insulin is also important in tightly regulating the level of glucose in the blood. After a meal, the blood glucose level rises. In response to the increased glucose level, the pancreas normally releases more insulin into the bloodstream to help glucose enter the cells and lower blood glucose levels after a meal. When the blood glucose levels are lowered, the insulin release from the pancreas is turned down. It is important to note that even in the fasting state there is a low steady release of insulin than fluctuates a bit and helps to maintain a steady blood sugar level during fasting. In normal individuals, such a regulatory system helps to keep blood glucose levels in a tightly controlled range. As outlined above, in patients with diabetes, the insulin is either absent, relatively insufficient for the body’s needs, or not used properly by the body. All of these factors cause elevated levels of blood glucose (hyperglycemia). What is the impact of diabetes? Over time, diabetes can lead to blindness, kidney failure, and nerve damage. These types of damage are the result of damage to small vessels, referred to as microvascular disease. Diabetes is also an important factor in accelerating the hardening and narrowing of the arteries (atherosclerosis), leading to strokes, coronary heart disease, and other large blood vessel diseases. This is referred to as macrovascular disease. Diabetes affects approximately 17 million people (about 8% of the population) in the United States. In addition, an estimated additional 12 million people in the United States have diabetes and don’t even know it. From an economic perspective, the total annual cost of diabetes in 1997 was estimated to be 98 billion dollars in the United States. The per capita cost resulting from diabetes in 1997 amounted to $10,071.00; while healthcare costs for people without diabetes incurred a per capita cost of $2,699.00. During this same year, 13.9 million days of hospital stay were attributed to diabetes, while 30.3 million physician office visits were diabetes related. Remember, these numbers reflect only the population in the United States. Globally, the statistics are staggering. Diabetes is the third leading cause of death in the United States after heart disease and cancer. “I thought the question “ How Do You Know You Have Diabetes?” was in order, after all, it is how it all starts. Well, like a lot of people with type 2 diabetes, you don’t! The reason for this is that the symptoms can be so mild and develop so gradually that you do not even notice them or you do not even have any symptoms. I became a diabetic when I was 59. I had a family history of diabetes that went directly back to my father and his mother, so the chances of my getting diabetes were always pretty good. So for me, the question “How Do You Know You Have Diabetes? was always something I knew the answer to. I had a pretty good handle on Diabetes Symptoms. Nevertheless, knowing I had this family history, whenever my doctor would have me get a blood test, the first thing I always asked was, “how is my blood sugar?” and I was always relieved when the answer came back “good”. I was always very concerned because I had a major sweet tooth. It’s funny or sad, depending on how you look at it, here I am concerned over the results of my blood sugar test, but not concerned enough to do anything about my eating habits. I guess a better way to characterize my concern would be to say I was relieved, that way I could keep on with my bad eating habits and feel alright about it. unexplained weight loss or more infections than usual. I can tell you that I experienced three of these and it seemed to me that they started almost overnight. The first things I noticed were excessive thirst and urination. Wow, for as bad as it was I might as well have pitched a tent in my bathroom and brought along a cooler full of drinks. It was bad. The third thing was my sight. I am far sighted, but all of a sudden I could not see things 10 feet away, they were all blurry. The really amazing thing to me was that I could read the finest of small print. My eyes had done a complete 180 degree turn around. Since my work required that I be on the road, this was definitely not a good thing. So, it was off to the doctor for me so I could get the official answer and, of course, I did have diabetes. It is easy to find out. If you think you have any of the Diabetes Symptoms mentioned above, a simple blood test will give you the answer. I mean, even if you are not experiencing the above symptoms, there are still reasons to have your blood sugar tested anyway. A family history of diabetes, you are over the age of 45 or you are under the age of 45 and are overweight. I am not talking about 5 pounds here, I meant, overweight! These are all reasons to have your blood sugar tested. In addition to your current blood sugar level, which the doctor can check right in his office, the blood test will give your doctor (and you) additional information about your blood sugar that can be traced back 90 days. This result is pretty much the confirmation that you are a diabetic or not. The Women of our World take responsibility for our lives, take value in our purpose and Take Action! This website is really a stroll-through for all the information you needed about this and didn’t know who to ask. Glimpse here, and also you’ll positively uncover it. Congratulations on possessing actually one of one of the vital refined blogs Ive arrive across in a while! Its simply wonderful how a lot you’ll be capable of contemplate away from a thing basically simply due to how visually gorgeous it is. Youve place collectively an amazing blog website house –nice graphics, motion pictures, layout. That is certainly a must-see web site! Many thanks for posting this, It?s simply what I used to be researching for on bing. I?d quite a bit relatively hear opinions from an individual, barely than a company web web page, that?s why I like blogs so significantly. Many thanks! I’ve not too long ago started a blog, the knowledge you present on this site has helped me tremendously. Thank you for your entire time & work.